Andrew Gregory made this programmer for his Junior and his DOS65 system I have now, Shown here complete with hardware circuit diagrams and software in Junior and OS^5 format. 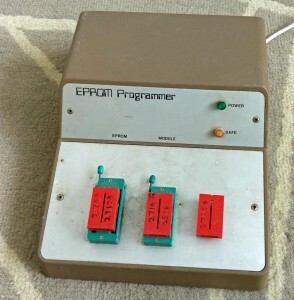 Paperware service – A 6522 controlled Eprom programmer. Voltage selection : Automatic, by software. Device selection : Plug-in modules to define device pinning. Written on : DOS65 using AS65. Memory : Code and workspace $2000 – $2C00. Remaining ram is a buffer area for copying eproms to and from. Check device empty. Address parameters allowed. Program speed: Up to 1K per 10 seconds. Data is transferred to the eprom and the `registers’ of the programmer through port A of the VIA while port B controls the mode of port A and the PGM, OE and CS connections to the eprom. 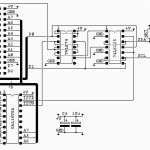 There are registers for setting the volts, and the upper and lower bytes of the eprom address. Each of these is formed from a pair of 74HC173 latches. The remaining digital circuit consists of a decoder (74HC138) some buffers and gates. Particular care has been taken to ensure that the latches are not triggered by noise. The eprom voltages are generated with 723 regulators with VFETs to change the voltage by switching in different resistors. The voltages can be switched in 300 microseconds allowing interactive programming techniques. 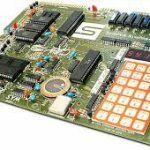 In this article I describe a simple Eprom programmer which can be used with any computer which has a spare 65(C)22. Originally I designed it to work with the Junior but with the intention of making it adaptable to future computers such as DOS65. If used with the Junior it connects to the 6522 as an alternative to a printer. To add a 6522 to a 6XXX computer with an expansion bus is not too difficult but use of only one 6522 adds complexity to the design. To simplify matters plug-in modules containing wire links appropriate to the pin-outs of different eproms are necessary. This limitation should not matter to the amateur since only a small number of eproms have to be programmed. Some commercial programmers have plug-in modules or switches too. The present software (v1.0) runs on an expanded Junior with a 64K memory card. Adaptation to suit other computers is not difficult. Power source .................... 9 to 12V/ 300mA DC from computer. Device selection ................ By software and plug in module. Eprom voltage selection ......... Programmable. *Read ............................ Copies eprom to ram. *Program ......................... Copies ram to eprom. *Verify .......................... Compares ram and eprom. *Base . .......................... Allows entry of first ram address. *Check ........................... Checks eprom empty. Device .......................... Allows selection of device type. Modify .......................... Allows ram contents to be altered. Hexdump ......................... Binary and Ascii dump of ram. 2716/2516, 2532, 2732(A), 2564, 2764(A), 27128(A), 27256, NEC 27256D (21V), 27512. (2532, 2564 and 27512 untested). The 27513 which has four pages of 16K has not been included, but it seems very likely that it could be programmed too. Programming speed: The simple fast programming algorithm operates at a maximum rate of one kilobyte per 10 seconds (this is dependent on the type and condition of the device). Green LED ....................... Power on. Orange LED ...................... Safe. Do not remove eprom unless lit! The hardware falls into two sections. These are the programmable power supplies which generate programming and power supply voltages for the eprom and the digital logic. 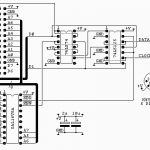 In this PDF the circuit diagrams are shown. A. PB3 is an active high reset output. It floats high and resets all the programmer registers whenever the 6522 is reset. PB4 and PB5 are eprom control (EC) outputs which connect through inverters to OE, CS, A14, or A15 of the eprom. PB7 is the VIA monostable output which is used to provide programming pulses. Since VIA monostable pulses are always negative they do not suit all types of eprom. So PB6 is used to control their polarity with external logic.Before data can be written into a register the eprom programmer is `primed’ by selecting a dummy register in advance. The purpose of this is to improve noise immunity. The functions of the ports and registers are summarised below. Table 1 – Port A functions. Table 2 – Port B functions. a T10. If the 6522 is reset this will rapidly occur. This is important because eproms are damaged if Vpp is present in the absence of Vcc. 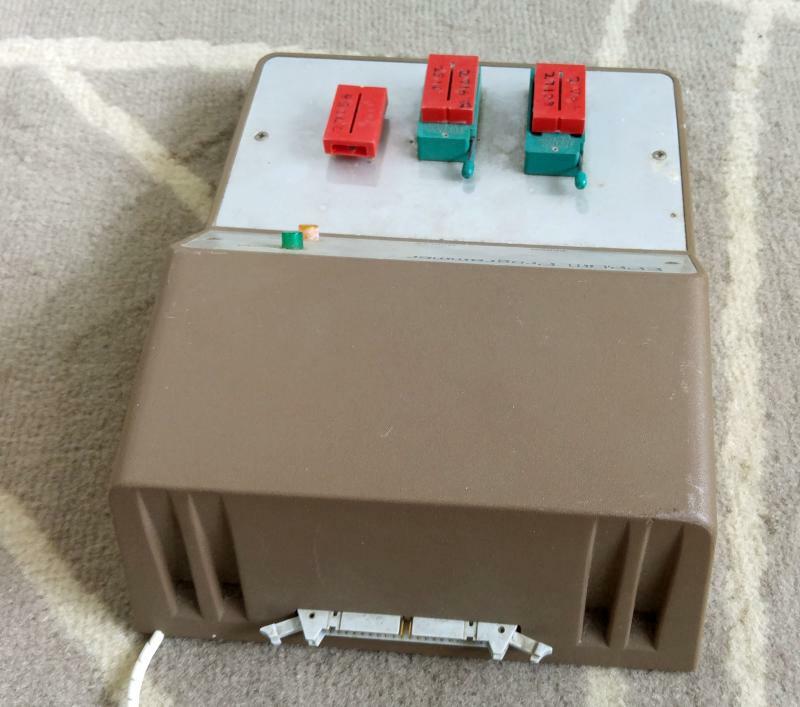 The high voltage (~30V) at the input of the programming voltage regulator is generated by a 78S40 inverter. Vcc is switched on by applying logic 1 to the base of T4, which turns on T3. Vpp works in a similar way. A time delay of about 20 milliseconds following switch on is required. Vcc may be switched between 5 and 6 volts, and Vpp between 0 (using T10 as a short), 5, 12.5, 21 and 25 volts in 300 micro-seconds, perhaps less. Note that T5 requires a heatsink. not work. However it is not always effective as the HCMOS output seems to become high impedance when the power is switched off and CB1 is triggered by noise. I think the addition of an emitter follower will cure this problem. But this is a minor point. Each of the signal connections to the eprom is made through a 470 ohm resistor to limit the current in the event of a wrong connection. 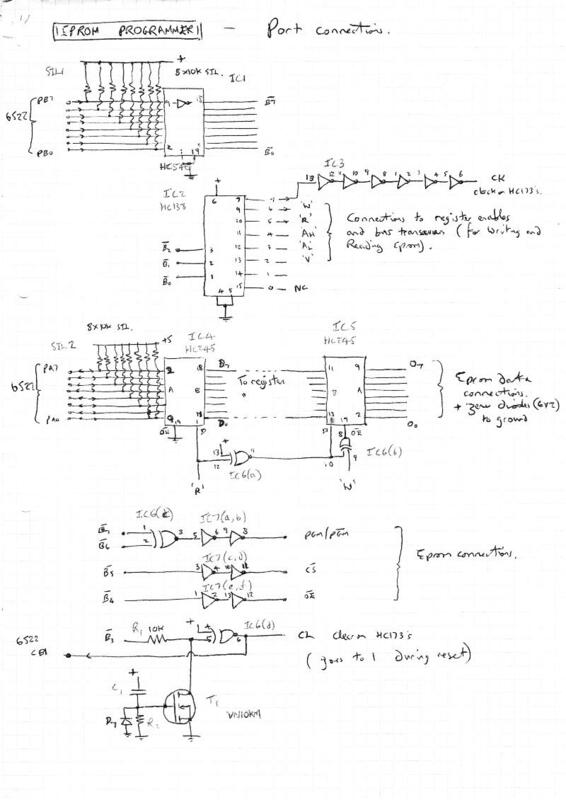 If desired the digital IC’s can be protected from accidental connection to Vpp by the addition of 6V2 400mW zener diodes from their outputs to ground. 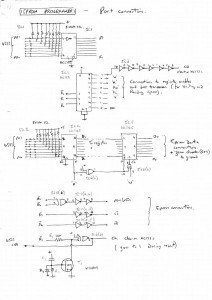 In this section I describe the constructional techniques which I employed, and in particular, a way of solving the awkward problem of mounting ZIF sockets on front panels. Also I have included details of socket and module wiring. The constructor can ignore this section entirely, if he wishes. One of the first things to do is to choose a case to put it in. (If any). In my version this was Vero model 75-1715G, a plastic case with a sloping aluminium front panel. The case accommodates a large PCB (PCB 1) on which all the components are mounted and a small PCB (PCB 2) to which the eprom and module are attached. The eprom and module sockets. The modules are 24 pin DIL plugs with wire links to suit different devices. Eproms and modules are held in 28 pin and 24 pin zero insertion force (ZIF) sockets mounted on PCB 2. I used `ZETRONIX’ ZIF sockets because they can be dismantled and with suitable holes (3mm countersunk in base, 5mm in slider) bolted onto the aluminium panel leaving the pins protruding through slots. The PCB which has corresponding slots is bolted underneath the panel making the ends of the pins about level with its’ copper side. Reliable connections to tracks at the edges of the slots can be made with wire links. A 50 way transition connector is soldered to the copper side (by bending the pins over) and a 50 way ribbon cable is attached. The wires of the ribbon cable are used in pairs so there are only 25 connections, the Vcc, Vpp and ground connections are made separately. The ribbon cable attaches to PCB 1 with IDC connectors. The main board (PCB 1). All remaining components are soldered to PCB 1, which for ease of construction is single sided with a great many wire links. When designing the circuit layout possible decoupling problems must be borne in mind. It is advisable to distinguish between digital and analogue ground, preferably with these and the 0V connection to the eprom meeting at one point. Plenty of decoupling capacitors should be included. Wiring of the 40 way connector. Digital connections to the 6522 are made with 40 way ribbon cable attached by 40 way IDC connectors at each end. The wiring corresponds to the pin layout of a 6522, only CA1 and CA2 are out of sequence. Alternate wires of the cable are grounded to improve noise immunity. Table 3 – Eprom connections and voltages. Vcc (Read) = 5 volts. CS (Chip select) = CE (Chip enable). Table – 4. Table – 5. The remaining pins (D0 – D7, A0 – A7 and ground) of the eprom socket are common to all the eproms. They are not, therefore, connected to the module, but directly to the eprom socket. Note that there is no connection to pin 13 of the module so that in the event of its accidental reversal Vpp is unconnected. Comparison with the pin layout of a 2764 or 27128 reveals that the links on the module for these devices go straight across (pin 1 to pin 24 etc) except that there is no link from pin 12 to pin 13. Table – 6 Module wiring. So for example on a 27512 module pin 1 connects with pin 16. Two versions of the software are available: a ROMmable version for the Junior and as a DOS65 command. Download here the sources of the Junior version , and here the DOS65 version. (i) Base: This is the base address of the Juniors’ ram from which all read, program and verify commands start. (ii) Check: A routine to check that the eprom is empty is called. where <a1> is the start address and <a2> the end address of the eprom. (iii) Device: This allows selection of eprom type. <l> is not entered a menu of available types is printed. (iv) Program: The ram area starting from base is copied to the eprom. (v) Read: The contents of the eprom are copied into ram starting at base. length exceeds the length of the buffer. ram starting at base and differences are printed in blocks of 16. (vii) Modify: The ram can be changed with this instruction. where <xxxx> is an address. To escape from modify type <CR> on a blank line. <+> and <-> may be used to go forwards and backwards and new bytes can be typed in. Ascii characters can be entered if they are preceded by a quote. A number of bytes can be typed on one line. e.g. (ix) Quit: Go to Junior monitor. D A Device = 2716. (If the ‘A’ is omitted a list is printed). or P ) Copy ram $3000 to $37FF to entire eprom. P 300,800 Error message, end of eprom exceeded. NMI and keyboard breaks cause the programmer to be reset and an abort message produced. The vectors are restored to their original values on quitting. The requirements of the terminal are the same as those for Micro-Ade, i.e. it has to keep a local copy on the screen of characters typed from the keyboard and accept LF, CR and DEL control codes. A 2MHz DOS65 version of the software has an additional `!’ command to call other programs in a similar way to EDITOR. So for example to save a block of memory you would type: !save filename 3000,37FF. However this awaits the construction of a 6522 card with a 40 way IDC plug, and perhaps with 64K of ram (2×62656). article or makes improvements I would like to hear about them.